Some friends were having a party and asked everyone to bring a snack to share. Why can't I just make a pan of brownies? Well, for one thing... did you know that making pops yields more servings per batch than traditional-sized brownies? Plus, these are SO much more festive! Who doesn't love food on a stick?! 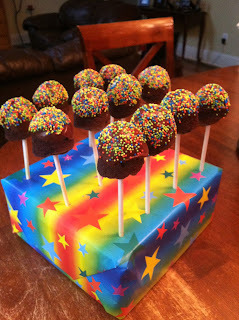 I have a Wilton brownie pop silicone pan, so I baked them and stuck the sticks in them as they cooled. In the meantime, I melted some chocolate chips and filled a bowl with neon non-pareils. I also gift-wrapped some styrofoam blocks together for the display. Once everything was ready, I dipped each of the pops half-way into the melted chocolate and rolled them around in the sprinkles. I made two dozen pops and allowed them to set. At the party, they were a hit... Zero leftovers!